The CD4056B IC's are single-digit BCD-to-7-segment decoder/driver circuits that provide level-shifting functions on the chip. This feature permits the BCD input-signal swings to be the same as or different from the 7-segment output-signal swings (VDD to VEE). Operation of liquid crystals with CMOS circuits provides ultra-low-power displays. Equivalent ac output drive for liquid-crystal displays - no external capacitor required. Voltage doubling across display, e.g. VDD - VEE = 18 V results in effective 36 V p-p drive across selected display segments. Low- or high-output level dc drive for other types of displays. On-chip logic-level conversion for different input- and output-level swings. Full decoding of all input combinations: 0-9, L, H, P, A, -, and blank positions. Strobed-latch function-CD4054B Series and CD4056B Series. Maximum input current of 1 µA at 18 V over full package-temperature range; 100nA at 18 V and 25°C. 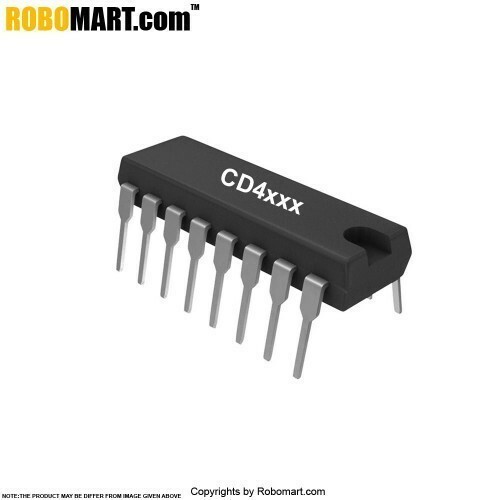 Also Searched as : CD4056 ic.